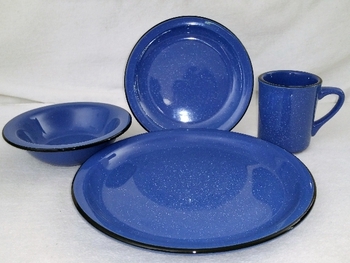 This 16pc rustic pioneer dinnerware set features a narrow black painted rim and each midnight blue piece is speckled with white (like starts in the midnight sky). This hearty dinnerware collection is a unique mix of color and nostalgia. Each place setting (4 place settings per 16pc set) includes: 10 1/2" dinner plate, 7 1/4" side plate, a 13oz. bowl, and a 8.5oz. mug. Product is Dishwasher and Microwave Safe.